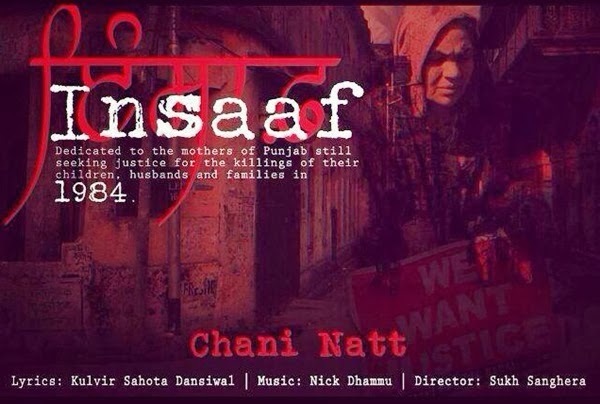 Insaaf is a Punjabi Song by Chani Natt dedicated to the mothers of Punjab still seeking justice for the killing of their husbands, children and Families in 1984. Lyrics are penned by Kulvir Sahota Dansiwal. Insaaf is a Punjabi Song by Chani Natt dedicated to the mothers of Punjab still seeking justice for the killing of their husbands, children and Families in 1984. Lyrics are penned by Kulvir Sahota Dansiwal. Music is composed by Nick Dhammu and Video is made by Sukh Sanghera for 10+1 creations.